Sustainable living is a lifestyle that attempts to reduce an individual's or society's use of the Earth's natural resources and his/her own resources. Often Sustainable living called as Green Living. The stamp of $ 1.40 presented a Conserve Water Practice.The typical home uses about one-third of their water outdoors, irrigating plants and watering lawns -- and up to half of that just evaporates. Sunshine Skyway Bridge is a 6.7km-long bridge built over Tampa Bay, Florida, US. It is considered to be the longest cable stayed concrete bridge in the world, while the Travel Channel rated the bridge as one of the top 10 in the world. Construction of the current bridge began in 1982, and the completed bridge was dedicated on February 7, 1987. United States Postal Service have issued one stamp series feature Sunshine Skyway Bridge on February 28, 2012. 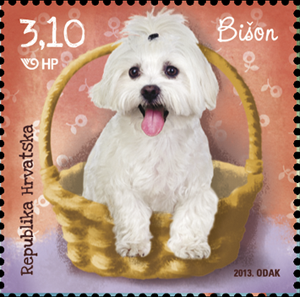 On April 08, 2013, Croatian Post issued one stamp set features dog as part Pets in the Children’s world. The issuance consist of four stamps depict dog species like: Bichon Frise, Yorkshire Terrier, German Shepherd, and Golden Retriever. Bichon Frise is a small dog, 23-30 cm tall, but strong, with deep thorax, weighting 3-6 kg. It is white, attractively looking, and lives about 14 years. It is a cute puppy, very likable and sociable. Extremely adaptable, cheerful and animated, bichon has gained many admirers . It has a beautiful head (with opulent hair and of pronounced round shape) postured high, short snout, black nose and round eyes of colour equally dark as the skin around them. The ears are covered in thick hair and are lowered alongside head and snout. Bichon Frise is an excellent family dog and are easy to train. It likes children, but they should not treat it as a toy.It barks very often because it has excellent hearing and hears everything. This breed requires regular combing, bathing, haircut and maintenance of hair and it is recommended to take bichon frise for professional maintenance every 4-6 weeks. The Carnival of Fano, dating back to 1347, is the oldest carnival in Italy, after that of Venice. Legend holds that it was born after the reconciliation of two of the town’s important families at the time, the Dal Casseros and Da Carignanos. > the "Musica Arabita," the colorful and quirky musical group that has sounded on pots, pans and coffee cans since 1923. Italian Post issued one stamp on January 12, 2013, shows a number of figures in costume related to Fano Carnival, and the “prendigetto”, a characteristic container used to catch the sweets thrown from the floats during the celebrations, regarded as the most popular and important in the Marche region, as well as the oldest in Italy. The adoption of the UNO Declaration is the clearest indication yet that the international community is committing itself to the protection of the individual and collective rights of indigenous peoples. Regarding this matter, on 11 October 2012, the United Nations Postal Administration issued 18 commemorative stamps in denominations of US$ 0.45, CHF 0.85 and € 0.70 in a mini-sheet format of six stamps each on the theme "Indigenous People". This is the third in a series of stamps on Indigenous People, which were painted by the artist Stephen Bennett (USA). The top row stamps represent (from left to right):The God Must Be Crazy (Namibia,2002), Maiko of Kyoto (Japan, 2012), Baby on Her Back (Tibet, China 2012). The bottom row stamps represent (from left to right):Genesis Girls (Ethiopia,2010), Baby Bat (Mongolia, 2012), Goggle Girl (Tanzania, 2001). Fiji Post released a set of four stamps feature the Fiji’s Extinct Megafauna on August 15, 2006. The 50c stamp depicts Fiji Crocodile or Volia athollandersoni. Volia athollandersoni or Fiji Crocodile was an extinct genus of Fiji mekosuchine crocodylian. It was around 2–3 meters long. It is the greatest predator of the Pleistocene ecosystems of Fiji.Fossils of Volia athollandersoni have been found in Fiji Islands at Voli-Voli Cave and Wainibuku Cave. Since last year Liechtenstein Post issued the stamp series with theme of "Liechtenstein - Panorama".The last year started with two marks on "valley" miniseries . On June 14 , 2012 the se-tenant stamp issued under the theme "Mountain Landscape", as with last year's edition features a panoramic photograph back, which initiated in one of the Philately Liechtenstein and among members of the photo club spectral discharged competition was chosen as the winner Photography . The Xavier Roser made from Ruggell panoramic image was (also called rear Grauspitz, 2574 m above sea level. M.) from the Black Horn from the north-east of the Rhine valley down photographed and left shows the "Lawenatal" (face value CHF 1.00) and on the right the "Valünata” ( value CHF 1.00). Between them is the Rappastein (2222 m above sea level. M.). The Lawena (of Romansh lavegna: Avalanche), a summer Alpine working in a cauldron-like valley is, from the Rhine to reach her on a long and challenging walk. Mayoutte Post promoted the tourism of their beach, N’Gouja Beach through the issuance of one panorama stamp on November 12, 2007. Beach N'Gouja spreads its white sand along a large cove slightly curved, situated on the commune of Kani-Keli. A small ten huge baobab trees, planted majestically on the sand, emerging from the tropical vegetation that surrounds it. The light sand gives the ocean a beautiful color that ranges from turquoise and jade. Please see video of N’Gouja Beach .